We briefly review helicity dynamics, inverse and bidirectional cascades in fluid and magnetohydrodynamic (MHD) turbulence, with an emphasis on the latter. The energy of a turbulent system, an invariant in the nondissipative case, is transferred to small scales through nonlinear mode coupling. Fifty years ago, it was realized that, for a two‐dimensional fluid, energy cascades instead to larger scales and so does magnetic excitation in MHD. However, evidence obtained recently indicates that, in fact, for a range of governing parameters, there are systems for which their ideal invariants can be transferred, with constant fluxes, to both the large scales and the small scales, as for MHD or rotating stratified flows, in the latter case including quasi‐geostrophic forcing. 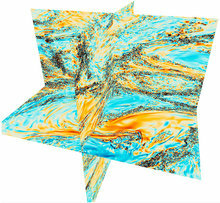 Such bidirectional, split, cascades directly affect the rate at which mixing and dissipation occur in these flows in which nonlinear eddies interact with fast waves with anisotropic dispersion laws, due, for example, to imposed rotation, stratification, or uniform magnetic fields. The directions of cascades can be obtained in some cases through the use of phenomenological arguments, one of which we derive here following classical lines in the case of the inverse magnetic helicity cascade in electron MHD. With more highly resolved data sets stemming from large laboratory experiments, high‐performance computing, and in situ satellite observations, machine learning tools are bringing novel perspectives to turbulence research. Such algorithms help devise new explicit subgrid‐scale parameterizations, which in turn may lead to enhanced physical insight, including in the future in the case of these new bidirectional cascades.